time-tested cure for a hard blow to the face. I was quite fortunate to meet and get to know a lot of impressive bike riders on Race the Ras. But if someone asked me to pick my 'man of the Ras', there would be no contest. It'd be Niall. No doubt jongen. By a long shot. 'No one else in the photo' as they'd say in Belgium. I met Niall on the road on the first day of the Ras. He looked totally euro pro, Assos shorts, kit all matching, bike clean and impeccable. Pedalled great, smooth on the bike, perfect position. He was familiar with most of the climbs we'd be doing. He knew their savage nature, and counseled us yanks to respect what lay ahead. Wrapped up in my own personal pain cave at the finish in Lisdoonvarna, word filtered in later that Niall had been taken out by someone sprinting for the finish who rammed him from behind. It was a bad crash. His road rash was extensive. I saw him on the line the next morning though, arm wrapped up, yet shrugging it off as if it were no more than a paper cut. Road rash didn't slow Niall one bit. His run of bad luck continued. After the finish in Clonakilty, he was cycling into the town when a clueless pedestrian walked right out in front of him. Big collision, crash. Again. This time they suspected a broken cheekbone, were going to take him to the hospital to get checked out. His face was red and swollen like those old photos of Eddy Merckx in the 1975 tour when after a similar freak collision, he was forced to finish the rest of the Tour on pureed food and applesauce. Most recreational cyclists would have called it a day then. But Niall was at the start the next morning though. Brushing it off again. Concerned, I asked him how he was feeling. He stoically shurgged, and said it wasn't broken, it wasn't so bad. No doubt about not finishing. A real hard man. 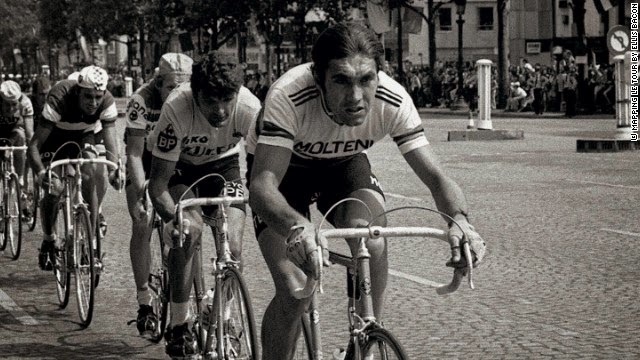 Eddy Merckx got up from a smashed cheekbone to finish 2nd in the '75 Tour, leading the pack into Paris, still attacking Thevenet till the end. It was a courageous feat on cycling's biggest stage that many still remember. 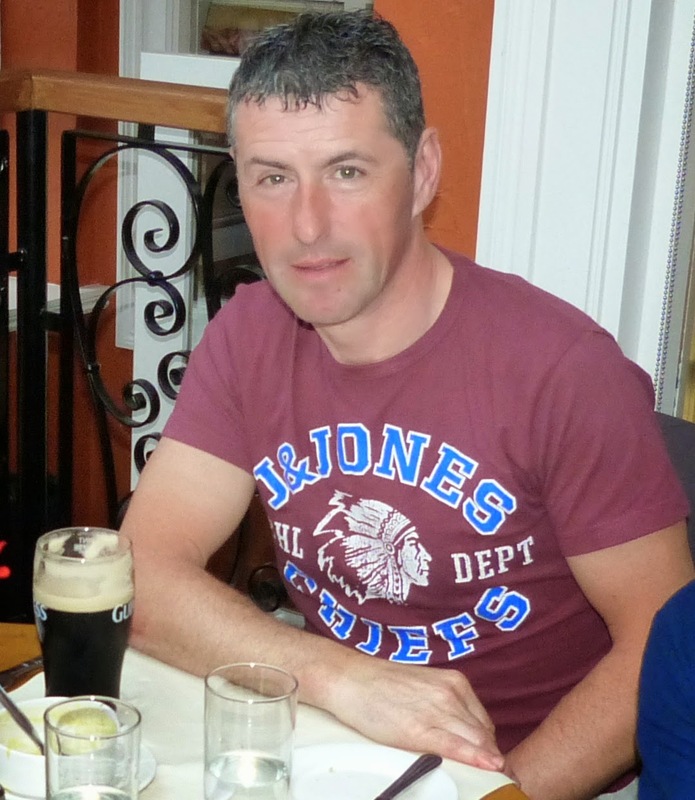 Niall also smashed his cheekbone, and got up the next morning to tow Race the Ras at high speed through Cork. 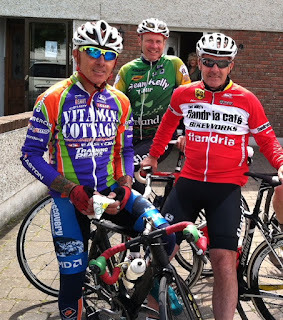 Unlike Merckx, nobody was paying Niall to do it. He kept riding out of respect for the Ras, and because that's what real bike riders do. Give an anonymous character demonstration that won't be glorified in any cycling magazines. No matter. I'll always remember it as being just as impressive. Years from now, when my mental film of the Ras week has blurred together in a melange of rain and wet clothes and Guinness and damp cold and GAA tea stops and green and sheep and laughter and heavy roads, my memory of this quiet, courageous hard man from Cork will remain crystal clear. Because Niall is my Man of the Ras. Grid not sure how all this stuff works yet. So bear with me . Hi fast eddy!